Mrs Jack Payne Penhallow Post Office – September 2nd 1965. Having lived at Lambourne for 21 years I remember Jack and his mother very very well. I played snooker with him and Reggie Harris the blacksmith next door but one. Also playing then were Jack Stephens, Jack Angove, Bill Symons, John Pearce, Len Holland (cobbler at Perran), Laurie Trethewy, George Warne, Vivian Morris and my father. Jack was born in St Stephens parish and I remember his mother always loosing her glasses which she usually found on her head. When television first started Jack bought one and I was asked to get some groceries for my mother and I called at the shop. Jack was full of laughter as there was rugby on telly and when Jack asked his mother who was winning she said I think they’ve stopped playing because they seem to have lost something. Jack said they were in a “scrum”. There was never a dull moment when Jack was about and when he delivered the post if you had a postcard he would read it to you as he approached! 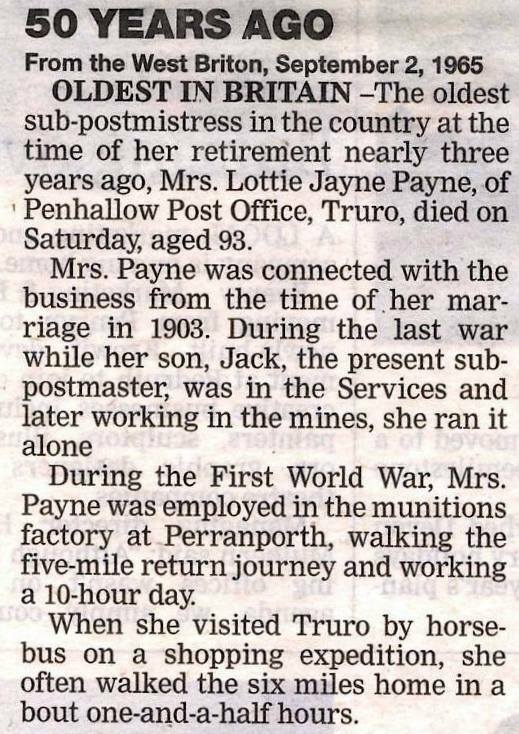 I am not sure that Mrs Payne was ‘Mrs Jack Payne’ as Jack was her son. I can just about remember her as a very old lady who pretty much stayed upstairs above the shop and Post Office being cared for by Jack. When she passed on, Jack married Doris and they both ran the Post Office and shop together until they retired and both passed away in the 1980’s. Jack’s shop was something to behold as it was full of boxes and odds and ends but he always seemed to know where everything was. After their deaths, the building fell into disrepair, (they had no children to leave it to), and eventually it was pulled down and a new house built further back from the road. Jack was quite a character and was a regular at the ‘Mens Institute’, the old chapel a little up the road, were he would have a game of snooker or two with Mr Pierce or Owen Dunstan, but made up for it by ringing the bells and singing in the choir every Sunday at Perranzabuloe.